I am going to talk mostly about the ALICE Large Combat Field Pack (rucksack) (bottom right) because that is the version that I used almost exclusively during my time in service. But I didn’t always have one. During my tour in Germany (75-78) I never saw them. We were issued strictly M1956 Load Carrying Equipment (LCE). I discovered ALICE when I rotated to Ft Lewis in the fall of 78. In stateside infantry units at that time we were issued medium rucksacks with frames and only RTOs got the large rucksacks. However, the large packs were sold at Clothing Sales. I don’t remember the price, but it was cheap. So just about every NCO and Officer bought their own for the field. And that was basically how it worked on my next tour in Hawaii. But it seems to me that when I inprocessed at the 82nd in 1983 everyone in the infantry battalions got issued the Large. In any case, in Airborne and Special Operation units the large ALICE rucksack was the standard. The Army and USMC experimented with various rucksacks in WW II including a “Jungle Pack” that looked a lot like some of the new jungle packs that are being tested today. There had also been a popular “Mountain Rucksack” issued to some specialized units. 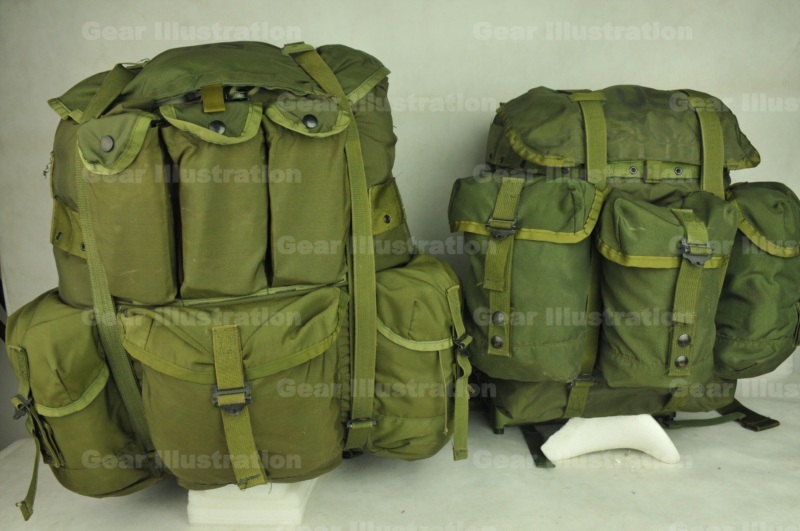 Versions of that ruck were used quite a bit by Special Forces in the 50s and early 60s. But conventional units in WW II and Korea mostly did without. Small packs carried the soldier’s fighting load and perhaps a minimal bedroll and everything else went into the duffel bag to be moved by transport. That worked after a fashion but usually left the foot soldier shivering in the cold in both conflicts. But even that less-than-satisfactory experience didn’t convince leadership to make a rucksack general issue to the troops. So the post-Korea M1956 gear was fielded without a rucksack component. Then came Vietnam. The long movements and extended operations in the jungle terrain kept adding more and more weight onto the soldiers’ backs. So eventually two different rucksacks were fielded during that conflict with mixed results. One is the Tropical Rucksack also called a Jungle Rucksack that I have on display (bottom left). As you can see it is nearly identical in size and pocket configuration to the medium ALICE. It has a spring steel X frame that is longer but similar to the frame on the canvas ARVN Pack. The other issued pack was the Lightweight Rucksack which came with a tubular aluminum frame. I don’t have one but if you have seen Platoon or some of the other Vietnam War movies this is the one the actors usually carry. Neither was entirely satisfactory in service but features of both were eventually incorporated into the ALICE packs. ALICE was very much a product of the hard lessons learned from extended infantry combat in Vietnam. It is what I would classify as an excellent combat patrolling rucksack. That is it was optimized to fight and live out of for long duration dismounted operations. Despite its origins, it was also definitely not just a jungle ruck. It was intended for worldwide deployments and functions equally well in the desert, mountains, jungle or artic. It is simple and adaptable and can readily meet the load carriage needs of the Paratrooper or the Marine and anyone from conventional riflemen to Green Berets and SEALs. 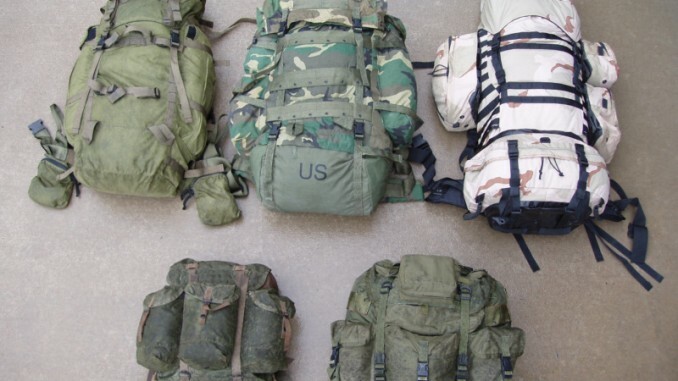 The ALICE rucksack is probably the closest thing to a truly universal piece of kit the US Military has ever developed. A number of packs have been tested or fielded in the interim intended to replace the ALICE. The first contender I encountered was the Lowe LOCO pack which came out in the early 80s. That eventually morphed into the CFP 90 which in turn led to the Gregory SPEAR pack and the USMC’s Arc’teryx ILBE pack. All of these were high end backpacks designed by leaders in the civilian backpacking industry. They had suspension systems that were much more comfortable than the ALICE. Yet none remained in service very long or were ever very popular with troops who live, work and fight with a rucksack on their backs. And the reason for their rejection was simple. None of them were very good combat patrolling rucksacks. The very features that made them attractive to civilian outdoorsmen made them less than ideal for soldiers as compared to ALICE. Three common characteristics in particular were problematic. Their height, the internal frames, and the extended padded waist belts. First, they were simple too tall. Extending above the shoulders as high or higher than the top of an individual’s helmet and blocking head movement and vision. Not necessarily a significant issue if conducting an administrative roadmarch for physical conditioning but a critical problem on a tactical Movement to Contact – even if just in training. Paratroopers probably disliked those long packs the most. None of them rigged very readily for airborne operations and because of their length they inevitably drag on the aircraft floor for even the tallest jumpers. And the shorter the jumper the more of a safety hazard the long packs became. I recall my ODA jumping the CFP 90s just one time not long after Desert Storm and that experience was so unpleasant that we went back to ALICE for good the next day. The internal frames are also not as suitable for combat operations as an external frame. Soldiers routinely carry heavy and odd shaped loads like mortar bipods and baseplates secured to the outside of their rucks. Tying items like that off to a rigid external frame rather than just to the exterior of the rucksack bag keeps the load much more stable and manageable. And as with the height issue mentioned above, internal frames are not conducive to easily rigging these packs for jumping as compared to external frame designs. Internal frame packs intentionally hug the wearer’s body when worn and do not leave space between to facilitate ventilation. Although admittedly this criticism is perhaps not as relevant today when body armor is routinely being worn. The tall internal frame packs also do not naturally sit upright like the short and squat ALICE with its external frame. Soldiers have to find something to lean the long packs against in order to load or unload items or even to put the rucksack on or off. The internal frame packs are simply less user friendly and can actually make the job harder rather than easier. The long packs all had extended padded waist belts that were intended to distribute part of the load onto the hips. Assuming an individual’s waist and hips were actually clear of fighting load gear. This wasn’t and still isn’t usually the case. In short, while well intentioned and sound in theory, wrap around padded rucksack waist belts always interfaced poorly with LCE / LBV or body armor and tended to get snagged or tangled up with the other gear. That made donning and especially dropping the backpacks much more complicated and troublesome than it had been with ALICE. And getting tangled up with a rucksack can be more than just an annoyance; it can be dangerous. Therefore most experienced troopers kept the waist belt / pad wrapped back around the frame or pack body and as much out of the way as possible. All the time. And from what I have observed that still remains true even today. Lots of people look at older gear as clunky and unsophisticated…and therefore deemed to be less effective than newer kit. I prefer to think of the ALICE pack as a flexible, rugged, classic design. And like all classics it continues to enjoy popularity at least in some professional circles because it always functions reliably. It gets the job done. When I retired a few years ago ALICE packs were still a fairly common fixture in many Team Rooms (I expect they still are today). Not because there were not newer “sexier” alternatives available or that people were adverse to change. But rather something that works as well as ALICE just doesn’t go out of style until something that is proven to be much better comes along. So far that hasn’t happened. It is no accident that the USMC’s current FILBE pack clearly shows its ALICE roots. And many of the complaints I have heard about the MOLLE II Large Rucksack could be fixed if it were actually a little more like ALICE (something I intend to discuss another time). Some might take umbrage if I called ALICE the gold standard of combat rucksacks. I agree that is probably too grandiose a characterization for the old girl. But I do think it is fair to say that the ALICE pack still remains the baseline standard by which all newcomers will have to be judged for many years to come. ALICE packs were obviously not perfect. That is also a fact. But I submit that if tasked to develop a single multipurpose or “full spectrum” combat rucksack today. One that could be versatile enough to effectively fill so many diverse roles for so many people in so many different combat environments. I have no doubt the resulting rucksack would look a lot like ALICE. And rightly so.